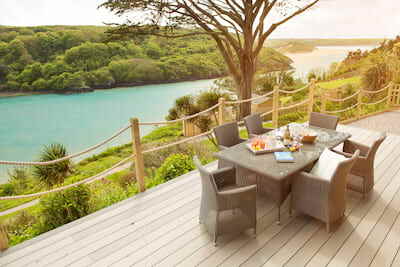 Elevated above the tidal waters of the River Gannel and Crantock beach - Waterside brings a unique sense of style and seaside luxury to your holiday on Cornwall's North coast. This majestic holiday home offers 2 large bedrooms, each with chic contemporary bathrooms, and a beautiful open plan living and dining space offering ample accommodation for all. Waterside offers a large decked sea-facing balcony, private parking and access to communal gardens on the riverbank. Explore the beauty of North Cornwall with around 8 beaches within a 5 mile radius, most of which are dog friendly all year round. Cornsih Gems guests have enjoyed the unique interior style and luxury of Waterside's location in all seasons. 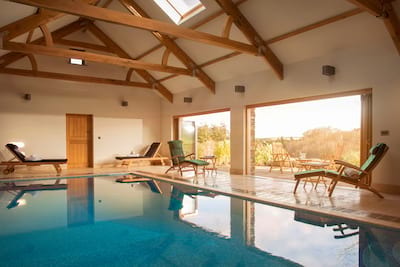 Waterside is set within the exclusive Corisande Manor located on the banks of the River Gannel. This split level apartment has been recently transformed with luxury in mind to create the perfect holiday base. Arrive to a large hallway leading into the hub of the home, the open plan living and dining space decked out with warm earthy hues of greens, oranges and mustard and much of the furniture inspired by the owners travels. From the moment you arrive, soak up the natural light from the many windows each framing the sea and river views perfectly and enjoy the sense of space with the original high manor ceilings. The living space brings friends and family together with large corner sofa and attractive armchairs. The dining table can be dressed to impress for celebrations or kept simple for summer suppers and lazy breakfasts. The smart modern kitchen is fully fitted and well equipped inviting foodie aficionados to get creative, the characterful Fern Pit Cafe nearby sells freshly shored Lobsters for a true taste of Cornwall. 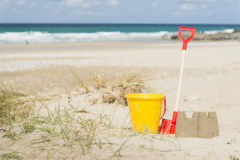 The ground floor cloakroom has ample storage for all your holiday kit from wetsuits to wellingtons. A central staircase leads to the first floor with 2 beautiful ensuite bedrooms. The master bedroom is a cool palette of muted greens and whites and is worthy of any boutique hotel with indulgent super king bed (zip/lock) and jackpot river views from every window. The second bedroom offers 3 single beds currently (please note from June 2019 there will be a super king zip/lock bed instead), a perfect escape for children to play. Both bedrooms are ensuite with contemporary fittings and luxury ambience. Throw open the double doors from the living space and enjoy the large decked wrap around balcony. 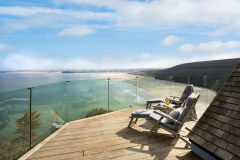 From this private elevated position, take in the 180 degree seascapes from the winding River Gannel to the mouth of the estuary and the beautiful Crantock Beach. With the golden sands of North Cornwall, the River shines a brilliant blue at full tide setting the perfect Waterside scene. A large all weather dining table and chairs offers al fresco dining options, especially when the sun sets. Beyond Waterside, guests are welcome to enjoy the communal gardens that lead down the river bank. At low tide you can walk to Crantcok Beach via the lowtide bridge or take the small water taxi at hightide. 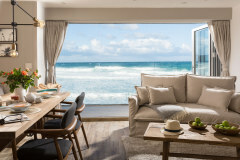 If surfing is on the agenda then you are well placed at Waterside, the world renowed beach of Fistral is just a walk away offering some of the best waves in the country. 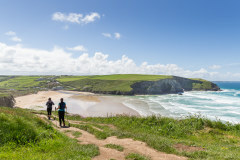 For an evening stroll then head up to Pentire Headland for a panoramic view of the coastline and welcome pre-dinner drink at The Lewinnick Lodge. 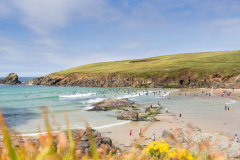 North Cornwall is firmly on the foodie map with the wonderful restaurants of Jamie Oliver, Rick Stein and Paul Ainswoth all within easy access or keep it simple with fish and chips on the quay in nearby Padstow. 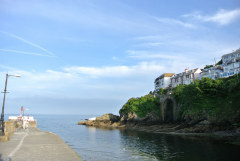 If you are new to this corner of North Cornwall or it has long been a family favourite then enjoy exploring from the comfort of Waterside, a truly wonderful holiday home-from-home. Waterside welcomes one well behaved dog, house rules and a small pet supplement applies. 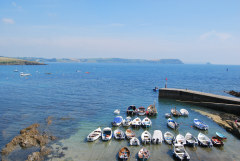 Beautifully situated with a fabulous view and top end furnishings which all made for a lovely break in this excellent and welcoming apartment. Just a short walk to beaches and restaurants that were great! We would not hesitate to book Waterside again. A super apartment, very well stocked kitchen for hosting a family dinner. A wonderful property spotlessly clean and beautifully furnished. The location exceeded expectation. 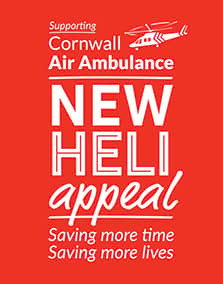 We had a fantastic weeks stay and we are planning our next break and looking forward to seeing what other Cornish Gems have to offer. 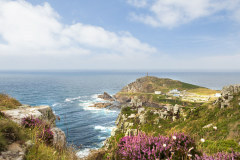 We would recommend Cornish Gems to who ever is looking for something special. Waterside is an outstanding property that certainly has the wow factor and is set in a beautiful location. It offers a relaxed private location with views one can truly appreciate. 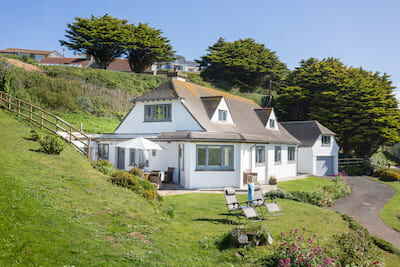 Perfectly located on the quieter side of Newquay but within easy walking distance of all local amenities, and just a five minute walk from both Fistral and Crantock beach. Waterside is like a little piece of heaven, a place where you can relax and just enjoy the views, the only down side was having to leave.